Posted October 16th, 2016 by Kent Gardner & filed under CGR Staff, Rochester Business Journal. Arthur Gardner was an electrician. Born in 1883, one year after Thomas Edison turned on the lights for 59 customers in Lower Manhattan, my grandfather was part of a new and rapidly growing occupation. He spent his workdays running wire through the homes of Chicago’s wealthy South Shore neighborhood. Electricity displaced the use of coal gas, which, in its turn, had displaced oil lamps and candles. Just as gas lighting propelled an expansion of industrial production and improved literacy, electricity—good for so much more than lighting—made vast new industries possible. Posted January 4th, 2012 by Kent Gardner & filed under CGR Staff. Despite issues weighing down the US economy –fiscal stress in Europe, continued high unemployment, and gridlock over federal fiscal policy – the Rochester, NY economy is a bit of a success story. As summarized in a recent Wall Street Journal article, Rochester, “ticks many of the standard Rust Belt boxes” yet has held relatively steady through the recession. As a participant in the Rochester Downtown Rotary’s annual economic forecast luncheon, I was pleasantly surprised by the generally upbeat expectations of my fellow panelists. Moderated by Sandy Parker, head of the Rochester Business Alliance, it included Steve Babbitt, chairman of the board of the Greater Rochester Association of Realtors; Brad McAreavy, president of the Rochester Auto Dealers’ Association; and Clayton Millard, first vice president of wealth management at Merrill Lynch. Posted September 14th, 2011 by Kent Gardner & filed under CGR Staff, Rochester Business Journal. It was Governor Cuomo’s father, Mario, who famously declared that you “campaign in poetry, but govern in prose.” Part of the poetry of the campaign was the usual rhetoric around job creation—Candidate Cuomo pledged to focus the resources and energy of the State of New York on the economy, particularly Upstate. The Regional Economic Development Councils is the vehicle by which Governor Cuomo is translating that bit of campaign poetry into energetic prose. The concept comes partly from Cuomo’s tenure at HUD, partly from a similar venture launched by the first Governor Cuomo in the late 1980s. 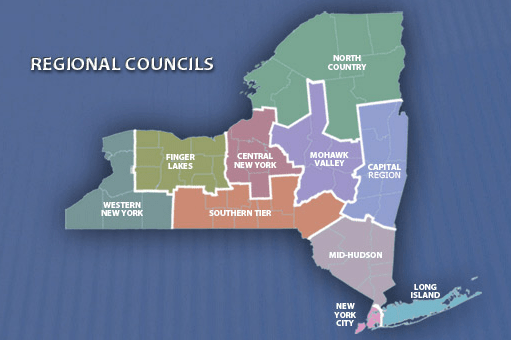 The concept has merit—by appointing key leaders to ten councils across NYS, he is engaging the state’s leadership in a manner that is largely unprecedented. With Lt Governor Bob Duffy as the chair of every council, he has assured both that council members participate and that the state agency representatives show up and provide support.